UDPR private company has launched a solar power plant with a capacity of 6 MW outside the village of Velyka Dymerka in Kyiv region, according to Ukraine's State Agency for Energy Efficiency and Conservation. 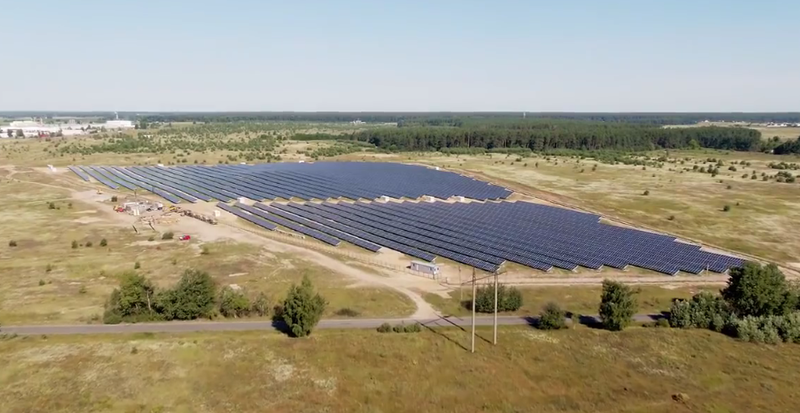 "A new solar park with a capacity of 6 MW has been built and put into operation near the village of Velyka Dymerka in Kyiv region," the agency wrote on Facebook. As reported, the solar power plant was built by UDPR in July this year. "It consists of 22,200 solar modules and covers an area of 13 hectares. The power plant will produce 6.8 million kWh of clean electricity per year," the agency said. Read alsoChornobyl may get giant solar parkAs UNIAN reported earlier, on October 1, 2014, Ukraine's Cabinet of Ministers approved the national renewable energy action plan until 2020, which provides for an increased share of renewables in the total electricity generation balance from 6-8% (today's figure) to 11%. Alternative sources accounted for 8.5% (including large HPPs and PSPPs) of the total electricity production over six months of 2017, according to the Ukrainian Energy and Coal Industry Ministry.